Sunrise Hitek, in collaboration with SmashToast, Inc., creates custom packaging for display in Walmart stores. Sunrise was given the specs and created the display in two weeks time. With an in-store deadline of less than two weeks, speed was key. SmashToast supplied Sunrise with the specs of the display and a sketch. Sunrise then turned that sketch into a plain cardboard prototype for evaluation and a full-color printed display. When Barnabas Helmy, founder and CEO of SmashToast, Inc., was looking for a packaging supplier in the Chicago area, he had a very tight deadline. SmashToast makes PUCK, a Bluetooth low-energy device about the shape of a mini hockey puck that is only 1.5” wide. The PUCK is designed to stick on the outside of any device that uses an infrared (IR) remote. Using a smart phone and the free PUCK app which is available for both iOS and Android devices, simply choose the device to control from the app. Next just sync the PUCK via Bluetooth and it becomes a remote for the device using a mobile phone. Since the connection to the PUCK is Bluetooth it has great range in the home or office and does not have to be line-of-sight like a typical TV remote where one has to point it directly at the TV for it to work. SmashToast had a great opportunity to get their USA made product, which is manufactured right here in Illinois, in several Walmart stores across the country as a test. 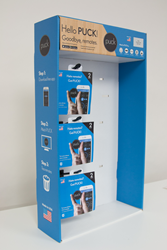 In order to be in stores though, they needed to have retail display packaging. The hanging endcap unit that Walmart specified was called Sidekick. With an in-store deadline of less than two weeks, speed was key. SmashToast supplied Sunrise with the specs of the Walmart Sidekick display and a quick sketch of what they wanted. Sunrise then turned that sketch into a plain cardboard prototype for evaluation and then a full-color printed display that was sent to SmashToast for approval. The entire first run of 150 units was printed and cut at Sunrise Hitek and then sent ready to assemble to SmashToast’s manufacturing partner in Central, Illinois. The PUCK is now available in 70 Walmart locations in IL, FL and TX. Sunrise is currently working with SmashToast on their second Walmart display, this time for use on a shelf. PUCK is a small, wireless device that allows control of devices in the home with a mobile phone. Simply place PUCK near the IR sensor on the device, download the free app, and toss all remotes! Sunrise Hitek was established in 1988 and employs the most advanced equipment and technology, such as G7-certified HP Indigo and UV flatbed presses, laser engraving, and digital die-cutting, to create best-in-class color printing, short-run packaging, P.O.P. retail displays, and signage products. A privately-owned enterprise, the company is based in Chicago and sells products worldwide.